Though it is Swiss, Geneva is an important transport center for the French Alps, whether by train, plane, bus or ferryboat—or rental car. If you plan to rent a car at Geneva Int'l Airport for travel only or mostly in France, read the important information on Geneva Airport car rental on the Geneva Airport page. The Gare de Genève Cornavin train station is an important rail hub not just for western Switzerland, but for the French Alps and indeed for this central region of Europe. Connected to the rest of the city by bus, trolleybus and tram lines, and to Geneva Airport (GVA; Cointrin) by frequent trains, it's the most important transport terminus in the city. Many of the city's hotels are clustered near it, within an easy walk. 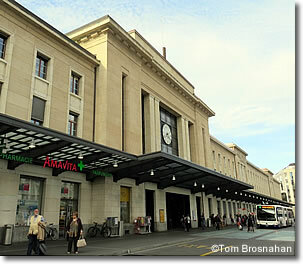 Geneva's small bus terminal (Gare Routière) is less than a 10-minute walk from the Gare de Genève Cornavin train station (map). An open parking lot with a small ticket office and waiting room, it serves regional intercity buses of the French Haute-Savoie LIHSA bus network connecting numerous French Alps towns with Geneva. See the Transport page of each French town for LIHSA bus information. International buses also depart the Gare Routière for other European countries, and as far away as the Balkans and Morocco. Also, guests at many hotels may receive a free public transit pass valid for the length of their hotel stay. Ask your hotel about it. Geneva has an efficient system of city buses, trolleybuses and trams operated by Transports Publics Génévois to take you from the train station to any other part of the city. Passenger ferries and excursion boats on Lake Geneva connect several communities both French and Swiss. Service is most frequent in high summer (June through mid-September), less frequent off season.